It is raining today. And instead of trying to say something important, I will say that. My office is on the second floor of my home, a little cutaway in the upstairs dormer. 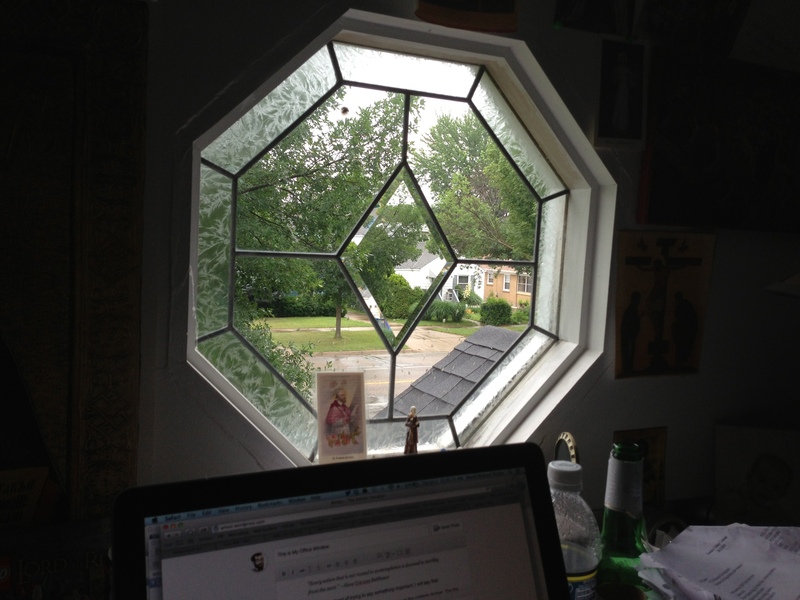 The the ironically-shaped octagonal window is situated just over my desk, both inviting me to look outward and warning me against getting distracted. This window represents my question . We need a boundary to our work, something that gently (or occasionally rather roughly) reminds us that our work is on the page, on the canvas, on the potter’s wheel. Writers write, artists deliver, deadlines and completing and all of that. Certainly. But on the other hand, art can be a lonely affair, especially if your art is of the solitary type. And what’s more, the introspection of the artists—a gift and a burden (he says, oh, so self-importantly—and now he’s writing in third person, as if to mitigate the irony with meta-irony—well, you can see how quickly it spirals into indulgence and distraction of a different sort. So what is the proper relationship between a) self-directed, introspective, let’s do THIS work here because this work is the work to be done, and b) the abandonment that is the root of contemplation—disinterested, outward, inviting? How can my window be both a window and shaped like a stop-sign?